This is another rare representation by the Russian archaeologist A.I. Solovyev, of a heavy charioteer warrior of the Indoeuropean Andronovo culture (2nd millennium BC) which flourished mainly in western Siberia and Kazakhstan, although the first archaeological evidence of this civilisation comes from a small area southwest of Krasnoyarsk. Its southern varieties were extended to modern Uzbekistan, Kirghizistan and Turkmenistan. Minusinsk Basin is specifically a region were the Andronovo culture evolved considerably. The Andronovo culture, named after the homonymous modern village, was the cradle of the Proto-Indo-Iranian IE group which later was divided to the Indo-Aryan and the Iranian subgroup. The Proto-Indo-Aryans gradually invaded and settled in the larger part of the Indian subcontinent although some of their tribes moved to the west, to the Zagros Mountains and the Black Sea steppes. The Proto-Iranians were divided into two branches. The southern branch – archaeologically represented along with the Indo-Aryans by Neo-Andronovo varieties and the Srubnaya culture – gradually invaded and settled in the regions of modern Iran, Afghanistan, western Pakistan, Tajikistan and the Zagros Mountains area, becoming the ancestors of the Sogdians, Medes, Persians, Bactrians and many other ancient peoples. The northern Iranian branch – archaeologically represented by the Karasuk culture being a local variety of the Andronovo– became the ancestors of the numerous Saka, Scythian and Sarmatian tribes. This is a rather rare representation by A.I. Solovyev, of a warrior of the Indoeuropean Karasuk culture (c. 1500–700 BC) which flourished in South Siberia and Central Asia. Its core region was located in the Minusinsk Basin, on the Yenisey River and on the upper reaches of the Ob River. This culture was probably the cradle of the northern branch of the Proto-Iranians who became the ancestors of the Sakas, Scythians, Sarmatians, Dahae, Parni (Proto-Parthians), Alans and other nomad Iranian peoples. Karasuk culture came from local varieties of the older Andronovo culture (2nd millennium BC) that was ancestral to the Proto-Indo-Iranian group. 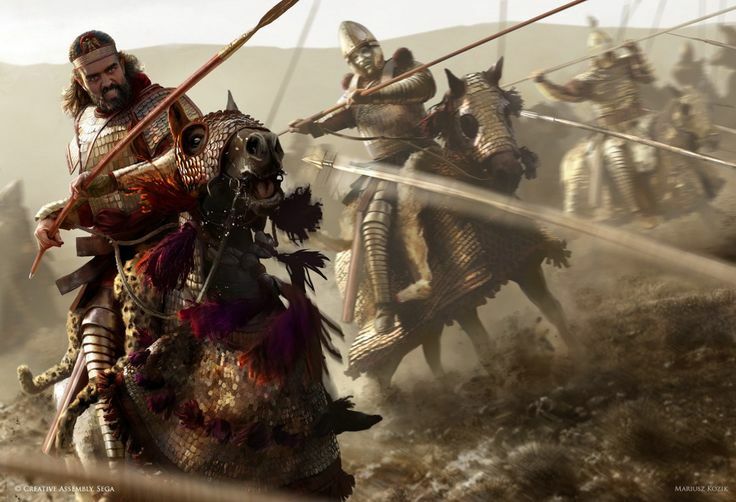 The onslaught of a unit of Sassanid or Central Asia Iranian cataphracts in a marvelous artwork by Mariusz Kozik (credit: Creative Assembly Sega/Mariusz Kozik). The following text is a small part of the Introduction of my study: Kataphraktarii and Clibanarii: Late Roman full-armoured cavalry. Along with it I give a gallery of cataphracts from most of the ethnic and cultural regions in which their use was spread over a period of two and a half millennia. The first cataphracts or clibanarii were rather an invention of the Iranian Saka tribes of the Central Asian steppes – being the ancestors of the Sarmatians, the Scythians, the Dahae and the Massagetae among many others – or the non-Iranian but Indo-European as well Tocharians of the same steppes that is the ancestors of the Wu Sun and the Yuezhi of the Chinese chronicles. The term cataphract is a Greek word (κατάφρακτος) meaning the ‘fully armoured’ warrior and was adopted by the Romans (catafractarius) while the other almost synonymous Latin term clibanarius is actually the Latinized and originally Iranian term grivpanvar which is possibly analyzed as griva–pana–bara, meaning the bearer of neck-guard plates being a feature of the early cataphracts. I prefer to use the more correct verbal type kataphraktos which is closer to the original Greek word κατάφρακτος but in this abstract I will use the Latin-originated term cataphract in order not to confuse the reader.